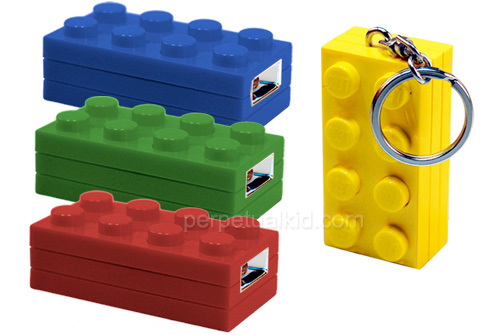 LEGO Block Key Light | OhGizmo! I’m sure these days there must be thousands of different kinds of LEGO pieces, and while it might not be used that often in the themed sets you can find at stores today, the 2×4 brick is still considered to be the iconic representative of the LEGO kingdom. And now you can keep one on your person at all times with this LED light keychain. I know at one point or another we’ve all accidentally stepped on one of these sharp cornered pieces, so I can say from experience that carrying one around in your pocket probably isn’t super comfortable. But do it for nostalgia’s sake! And with a flashlight always close at hand there’s a chance you may never accidentally step on a LEGO brick again! So it’s got that going for it too. From the looks of it one of the studs on top doubles as the power button, and like the real thing you can even stack multiple lights/bricks together. $9.99 from Perpetual Kid. I always thought the 2×2 block was the more iconic lego piece. The number of times I have stepped on a lego piece and expected my plantar fascia to be torn to shreds… oh man.